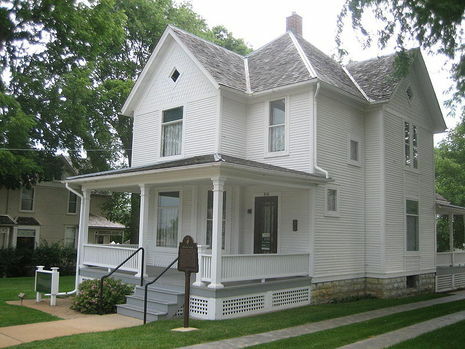 The Ronald Reagan Boyhood Home is the house located at 816 South Hennepin Street, Dixon, Illinois, in which the late former President of the United States Ronald Reagan lived as a youth beginning in 1920. The building was listed on the National Register of Historic Places in 1982. The Ronald Reagan Boyhood Home was constructed in Dixon, Illinois in 1891; its design is fairly typical of American houses during the time period. The house's original owners were William C. and Susan Thompson, the home was eventually sold in 1917. The home's most significant period was between 1920 and 1923 when Jack and Nelle Reagan lived in the house with their sons Neil and Ronald.During the period the house was occupied by the Reagans it was owned by John and Teresa Donovan. In 1952 the house was again sold and between 1975 and 1977 it changed hands twice. In August 1980 a group of local residents, led by Lynn Knights of Dixon, Illinois, purchased the home. The group was then known as the Reagan Home Preservation and Restoration Committee. The home is open to the public and operated by the Ronald Reagan Boyhood Home Foundation. On February 6, 2002, (Public Law 107-137), the United States Secretary of the Interior was authorized to purchase the property from the foundation and establish a U.S. National Historic Site under the jurisdiction of the National Park Service (NPS). The law specifies that the site will not be designated as the "Ronald Reagan Boyhood Home National Historic Site" until after the Department of Interior acquires the property. The legislation that became Public Law 107-137 was pushed through Congress by then-House Speaker Dennis Hastert over objections that the bill be delayed while the National Park Service conducted a study of the site. In 2003 the Department of Interior contracted private appraisals of the property which valued it at $420,000. The appraisal was millions of dollars below the amount sought as fair value for the house by the owners, the Ronald Reagan Boyhood Home Preservation Foundation. In late February 2003 the Reagan Boyhood Home Preservation Foundation formally rejected the government offer of $420,000 to turn the property into a National Historic Site, calling it insulting. The 1891 house is cast in the popular Queen Anne style. The 2 story house rests on a stone foundation and is topped with a gable roof which was originally covered with cedar shingles. The Reagan Boyhood Home is most significant as the home of the Reagan family, ergo, the home of 40th U.S. President Ronald Reagan from late 1920 until 1923. Reagan was nine years old at the time and in grade school. Though the family moved from the house they remained in Dixon throughout the formative years of the former president. For its association with Reagan and significance in the area of politics and government the building was listed on the National Register of Historic Places on March 26, 1982. According to the National Register of Historic Places documentation, Ronald Reagan has stated that the house was associated with important events of his childhood. However, his brother Neal has been quoted as saying that the house designated the Boyhood Home is the "wrong one for Ronald's principal memories of the town (Dixon)." One author, James E. Combs, called Dixon's claim that the "Boyhood Home" is the actual boyhood home of Ronald Reagan a bit bogus considering the Reagans moved often and only lived in the house for about two years. While they lived in the home the Reagan brothers shared a second-floor bedroom, despite the house having three bedrooms. Ronald's mother used the third as a work room. The lone outbuilding on the property was used by the brothers for such activities as raising rabbits. In the house's side yard Ronald and his brother would participate in pick-up football games.